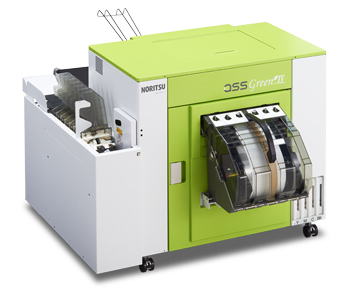 QSS Green IV is having built in Noritsu IJ technology, which uses wide variety of single sided roll paper. Ideal for Color Labs & Studios for high resolution Amateur as well as Professional Prints. Using the technology Noritsu has developed over the years as a leader in silver halide printing, QSS Green IV delivers a level of quality that exceeds all expectations. Post Card to 12" x 69.2"
The optional External Paper Magazine Systems automatically switches the paper roll and with this option two rolls can be loaded to QSS Green IV. The optional Print Sorter Unit automatically sorts a wide variety of orders and it improves the work efficiency. Noritsu EZ Controller is a complete professional workflow software solution that handles everything from print order management to image correction. EZ-Controller software utilizes exclusive AccuSmart™ image-processing technology to ensure consistent, high quality output.